Here's some more from second-wave Detroit cat, Marc Kinchen. He was mentored by Terrence Parker and his early output was very techno. As Separate Minds he released "1st Bass" in 1988; it sampled a sound from Konami's 1987 stealth fighter video game Metal Gear to generate an outrageous melody, then laid a vocal loop from Saunderson's remix of The Wee Papa Girl Rapper's "Heat It Up" over the top to create dance floor mayhem. In taking that video game sample and using it to create music, Kinchen was really pushing the concept of techno - a genre whose name was symbolic of where it came from, how it was produced, and where it was going. Probably only electro (the 80s form, not the current dross) could claim a similar relationship between intent and name. Having served his apprenticeship in Detroit, MK headed to the bright lights of New York where he became a leading exponent of dubby deep house (see K.E.L.S.E.Y's "Baby Can (M.K. Dub)" on the previous 313 Detroit post here). Eventually, he became one of the city's top remixers, helping Celine Dion and Betty Boo to achieve chart success... so no one's perfect. 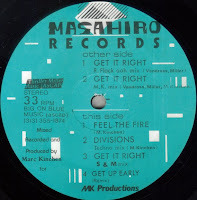 But essentially it's just a rehash of "Get It Right", which is uptempo vocal house music bedded over manic percussion (the vocal is courtesy of Aretha Franklin's excellent 1983 release of the same name). MK also introduces some great techno noises later through the mixes, adding depth and twisting them in new and pleasingly darker directions. 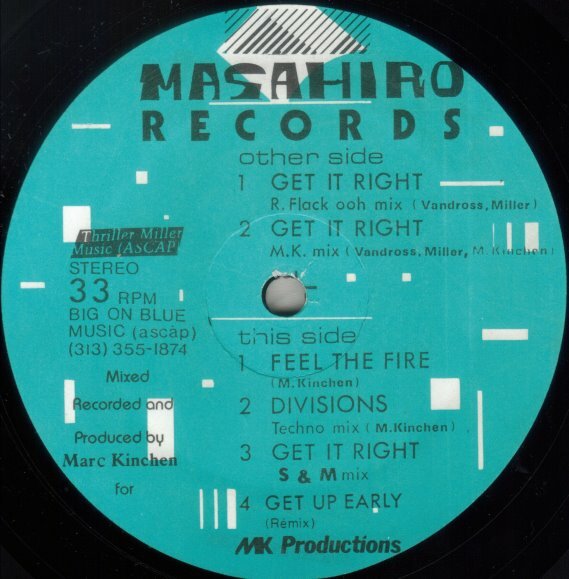 This release also has quality straight up Detroit techno in "Divisions" and another house cut in "Feel The Fire". All in all, really good stuff from a not too well known release.